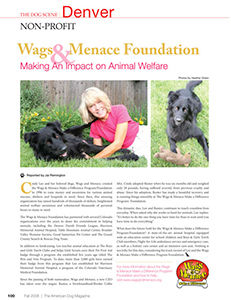 Wags and Menace Make a Difference Foundation has received many awards and recognitions by several organizations and businesses over the years highlighting their efforts within the community. 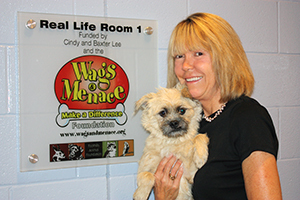 Cindy Lee and the Wags and Menace Make a Difference Foundation received the Sheilagh R. Malo Humanitarian Award for her many years of volunteer work in humane education, communications, and special events. Every shelter animal that Cindy Lee has promoted on the Denver KUSA-TV’s Petline 9 segment over the past two decades has been successfully adopted. “I feature animals from three different shelters every Wednesday at 6 a.m. and Thursdays at 4 p.m.,” she says. “Since I started doing this in 1997, that adds up to nearly 20,000 adoptions of formerly homeless pets!” The video below was produced by KUSA-TV in honor of Cindy Lee and the Wags and Menace Make a Difference Foundation for the Denver Dumb Friends League Petline 9 Homeless Dog Adoption segment. 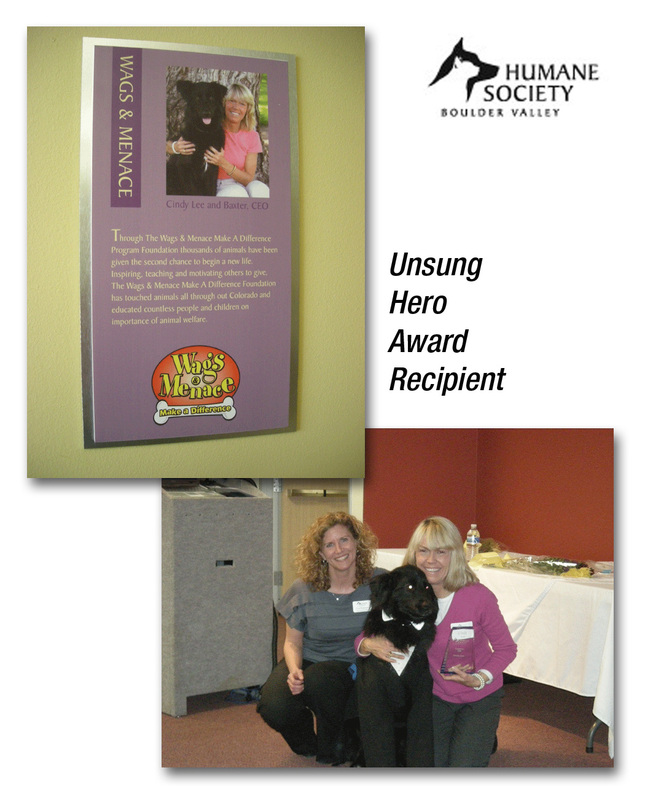 The Wags and Menace Make a Difference Foundation won the Unsung Hero award for raising funds for life-saving medical equipment needs at both the veterinary clinic and the humane society. The Foundation has also sponsored many sick and homeless animals that needed special medical attention and care. “I hope all of the medial equipment and care will help abandoned pets beat the odds and get a second chance on life,” Cindy Lee says. 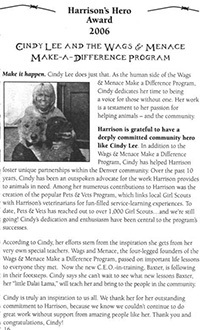 Cindy Lee has helped the PetAID Colorado foster unique partnerships within the Denver community and has long been an outspoken advocate for the work they provide to animals in need. 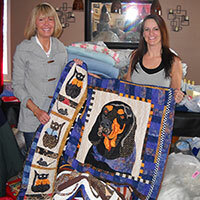 Among her numerous contributions are the Pets & Vets Program, which links local Girl Scouts with PetAID’s veterinarians for fun-filled service-learning experiences. She has also been a great asset to many fundraising events like Mutts and Models, Denver's premiere canine and celebrity fashion show. 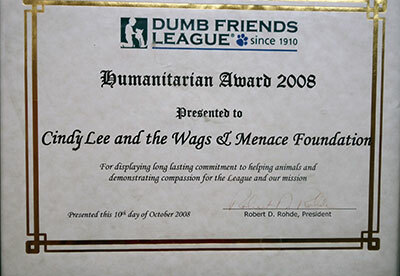 Cindy Lee and Wags and Menace Make A Difference Foundation was honored with an award for their continuous support of emergency medical care, food, and medical supplies for Pacific Marine Mammal Center in California. Red, a deaf Aussie Cattle Dog mix, received $1000 in funding by Cindy Lee and the Wags and Menace Make a Difference Foundation. The story of Red is an interesting one. No one knew the dog was deaf when she arrived at the Foothills Animal Shelter in Golden, Colorado. She was quickly adopted, but returned after her adopted family found out she was deaf. After hearing of Red and his situation, Cindy and her foundation stepped in to provide funding for special sign language classes. The story quickly went viral and was featured on multiple news outlets. AOL.com, people.com/magazine, Facebook, and Fox News. The press release and video are included here. (GOLDEN, CO – February 5, 2017) – Red, a 2-year-old Australian Cattledog mix originally came to Foothills Animal Shelter at the beginning of January. This petite girl has an extremely sweet personality, but unbeknownst to the staff at Foothills Animal Shelter, Red is also completely deaf. Because Red’s special need was unknown and she is such a nice dog, she was adopted by a family almost immediately after arriving at the Shelter. Unfortunately, she was returned just four days later. The family that returned her observed that Red didn’t respond to noises when sleeping and would get very startled when she was woken up. They family didn’t have the resources needed for this special girl, so she was returned to the Shelter. Now that Foothills Animal Shelter is aware of Red’s deafness, she is in need of a special home. In particular, Red will need a home where positive reinforcement training and sign language training is a priority. An owner who is willing to dedicate time to helping her learn hand signals is essential. Luckily, thanks to the generosity of Cindy Lee and the Wags and Menace Make a Difference Foundation, Red and her new family will get the training they need. A special grant from the Wags and Menace Make a Difference Foundation will provide Red and her new family with sign language and hand signal classes from a certified trainer. Red absolutely loves going on walks with the volunteers at Foothills Animal Shelter and will make a great companion dog for anyone willing to train her. Because she is deaf and gets startled so easily, she would do best in a home without kids or a lot of activity. She also may do best as the only dog in the home. The adoption fee for Red is $200 and includes her spay surgery, initial vaccinations, a microchip and a certificate for free veterinary office visit, in addition to the sign language classes funded by Cindy Lee and the Wags and Menace Make a Difference Foundation. 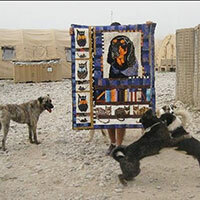 Cindy Lee and Wags and Menace Make a Difference Foundation have donated fleece blankets and supplies to the homeless dogs of the Puppy Rescue Mission in support of our troops and the homeless dogs of war they encounter every day. Click through the gallery to the right to see some of Cindy's efforts. The Wags and Menace Make a Difference Foundation's kind support during the mass Northern Elephant Seal Weaner stranding event of 2014 (29 weaners responded to) led directly to the NCMMC applying for and receiving notification of their approval for a National Fish and Wildlife Foundation Emergency Funding Grant. Wags and Menace Make a Difference Foundation, led by Cindy Lee, allowed us to literally put tons of fish into happy growing elephant seals for their rehabilitation, the National Fish and Wildlife Foundation has seen fit to further fund the hospital and care costs that NCMMC happens during this period. In addition, volunteers will have the funding to purchase materials needed to repair cement areas, fencing damage, electrical pump repairs, and maintain the NCMMC Rescue Truck as needed. 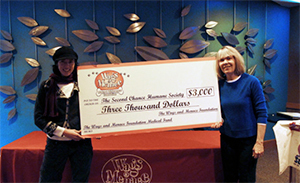 Cindy Lee and the Wags and Menace Make a Difference Foundation was recognized in the Heavenly Horse Haven Annual Thank You video for the foundation's efforts and funding for care and support. These pets all have a better life and a brighter future thanks the the generosity of Cindy A. Lee and the Wags and Menace Make a Difference Foundation. The Wags and Menace Foundation is the presenting sponsor of the Palm Theatre Extreme Stunt Dog Experience Show. Please click on the link below to to download the MP3 Podcast interview about this event and to listen to Cindy Lee, President of Wags and Menace Make a Difference Foundation. 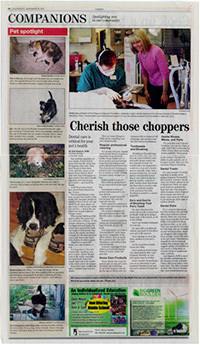 Cindy Lee and Wags and Menace Make a Difference Foundation were featured in the Boulder Daily Camera Newspaper after donating HSBV dental equipment to Boulder Valley Humane Society. This equipment ensures dogs in need of emergency dental work get the help they need. Click on the image to the right to view/download the PDF of the article. Ezra, a 5-year-old pit bull puppy, was brought into the Summit County animal shelter with a broken left rear leg. Originally relinquished to the Leadville Animal Shelter, neither the shelter nor the owner had the funds to give her the treatment she needed. “They gave her to us because they didn’t have the funds to repair the leg. We thought we could take it on,” said Lesley Hall, Summit County Animal Control and Shelter director. Thanks to a $1,000 grant from the Wags and Menace Make a Difference Foundation, Ezra was successfully treated at the Frisco Animal Hospital. 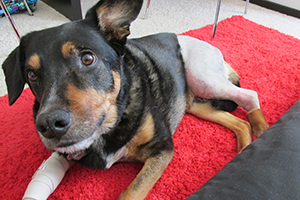 At first, veterinarians thought they would have to amputate her leg, but they were able to set the break in her femur with a plate and six screws. Animal control used money from the grant, as well as other donations, to pay for the surgery. 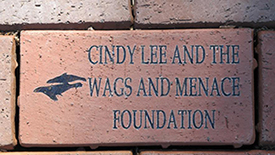 The foundation started in 1996, when Denver resident Cindy Lee adopted two dogs, named Wags and Menace, from a shelter. During the past three years alone, the foundation has raised more than $650,000 for the treatment and adoption of shelter animals. Summit animal control currently has 19 dogs and 17 cats in the shelter available for adoption. Last year, it found homes for 430 animals, breaking the record of 331 animals in 1999. Since recuperating from her surgery, Ezra has been able to live the life of a normal puppy with her new owner. A Frisco Animal Hospital veterinary technician who fostered Ezra during her recovery adopted her last week. Click on the gallery to the right to see pictures of Ezra. 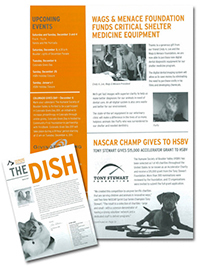 Cindy Lee and Wags and Menace Make a Difference Foundation were recognized in the BVHS "The Dish" Newsletter for their medical equipment donation. Click on the image to the right to view/download the PDF. 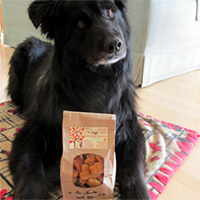 Kokopelli Barkery made a generous donation to Wags and Menace Make a Difference Foundation's CEO, Baxter to kick off Spring. 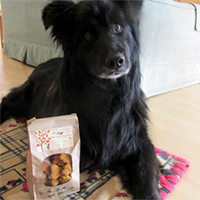 Baxter would like to thank Kokopelli Barkery for all they do to support shelter pets in the community. 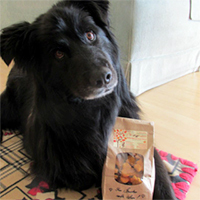 Click on the gallery to the right to view pictures of CEO, Baxter Lee posing with the treats. Cindy Lee of the Wags and Menace Make a Difference Foundation sponsored all of Scooby's urgent medical needs, extensive leg surgery, and treatment care. Scooby is now in rehabilitation mode and doing well. Scooby would like to thank Cindy Lee of the Wags and Menace Make a Difference Foundation for his covering all of his extensive emergency medical procedure and needs. Click on the image to the right to view/download a PDF of the article. Click on the image to the right to view/download the PDF article.